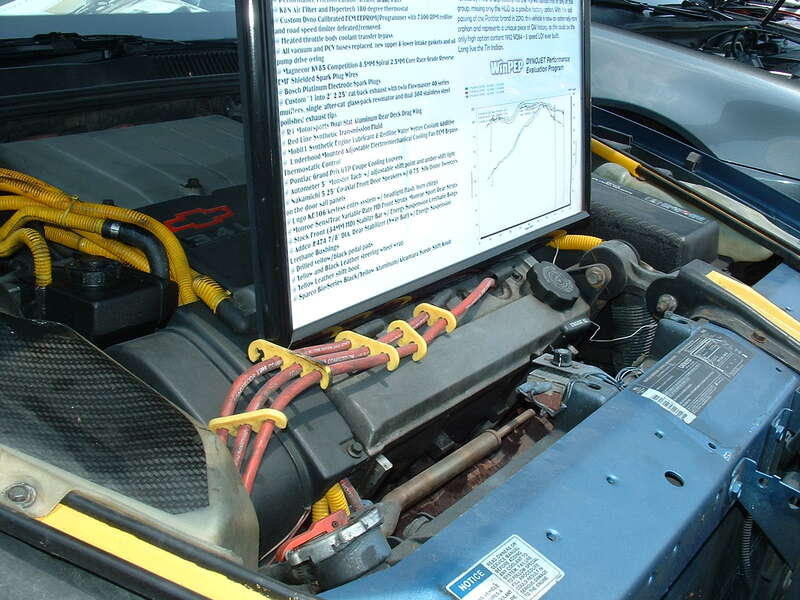 Nissan Frontier Forum > Nissan Frontier Forums > General Discussion > Oil Change Interval. With that said, I do run total synthetic in all my small engines. Funny thing, I don't think I let Subaru engine in my generator run long enough to break in before switching, as I get some blow-by and have to wring out the foam air filter once in a while. GMs factory fill in the 4th gen Corvette LT1 was Mobil1 and a nice 3D embossed sticker on the engine stated so, for all future oil changes. The claim was GM had no space under the tight hood for an oil cooler, as the Camaros / Firechickens w/ the same V8 architecture had an oil cooler so they could use either. The sticker is available out there in the world and since I always use Mobil1 in my weekend toy 3400DOHC Chevrolet engined Pontiac Grand Prix STE, I installed the sticker on that one as well. It's to the far right in this photo. Nissan is all over the place with this oil recomendation. The online manual for my 18 says "genuine nissan motor oil ESTER 5w30 sn is recomended" " if the above motor oil is not available use an equivalent motor oil that matches the above grade and viscosity. So nissan recomends synthetic. The 19 online owners manual says"genuine nissan motor oil 5w30 (no sn) or equivalent is recomended". "If the above motor oil is not available a SYNTHETIC sae 5w30 gf-5 sn motor oil may be used" I'm putting synthetic in my vq40. Thats what nissan (at least in 18 and 19) seems to recommend. Cheaper synthetics (amazon or supertech) may make sense here because of frequent changes? I will tow 3500 lbs with my truck so I would probably use synthetic even if nissan didnt recomend it. I didnt see anything in 2012 manual. In my defense, I am getting older and probably just getting set in my ways. I have been running junkers so long that mine is like a luxury vehicle to me. It's the nicest thing I have ever owned. Like I said I was just wondering cause I am planning on making the switch sometime. yes, I also saw Nissan recommendation for nissan ester... which is pricey. the Nissan dealer even stated that 5w-30 dino was an acceptable oil for those that can not afford or want a synthetic. the factory fill is 0w-20... for the Murano and Rogue. My local mechanic. Regular cheap 5w-30 every 3k. Religious about oil changes. Coming up on 190k. Oil and filter again on Monday. Conventional mineral oil, synthetic blend and full-synthetic will all work fine in a VQ40DE or any VG-series engine. the dealers here don't even carry the nissan ester oil. all they have is the conventional nissan oil or a synthetic blend. i use mobil 1 5w30 synthetic though. Mobil1 5w30 & Baldwin B1402 filter every 5k miles. It's easy to remember if the mileage is divisible by 5. I just use a mix of Flex Seal and Kerosene.. J/K.. I have free oil changes for another year and the dealership apparently used Mobil 1 Synthetic 5w30. Also, I don't honestly think that I've put 4k on any oil since I've owned the truck. Even if I went with the 5k interval, Nissan never indicates that synthetic is an excuse for a longer interval. Syn wasn't designed for that. It's better protection during an oil change cycle. I don't want to start a holy war but even with Nissan's golden Ester oil that they recommend, you'll notice that the 5k interval never changes. Food for thought. Same thing with my wife and her Subaru Crosstrek. That takes 0w20 and it's at max 7500mi interval. You don't have a 0 weight oil in conventional. They didn't start extending oil intervals until car reviewers and such started measuring yearly maintenance costs as part of review. Last edited by EricM; 04-06-2019 at 08:34 PM.